Today Cambridge's historic downtown has undergone a remarkable revitalization, and this town of 11,000 is an American jewel. Cambridge celebrates the heritage of their town and offers glimpses into the lives, labor, and leisure pursuits of its residents. Cambridge is well known for it’s downtown curio shops that offer everything from colonial furniture to aged glass figurines made in one of the many Cambridge glass factories. Visitors to Cambridge are encouraged to buy what’s called a “Glass Pass” which grants entry into the many glass manufacturers in the area. While to some, this might not sound like an exciting day, you’d be quite surprised at the level of craftsmanship you’ll witness and it will give you a new outlook on the process of art glass crafting. If spending the night in Cambridge, be sure to check out all of the inns and bed & breakfasts located in the historical downtown area. Designed by Columbus architect J.W. Yost, who also designed the Belmont County Courthouse, the Guernsey County Courthouse is an example of the Second Empire architectural style of building. It's only natural that a city with such a rich history in glass making, would have several glass museums. When Ebenezer Zane first passed through the area as he was constructing his trail, later called Zane's Trace, to Limbsville (now Maysville) Kentucky, he named the first settlement Cambridge in honor of Cambridge Virginia (just west of Richmond) near where his father was raised. The reason this site was chosen as a settlement is because it was the first obstacle that Ebenezer reached in blazing his trail. That obstacle was Wills Creek. The trail had crossed multiple small streams up till then, but Wills Creek required a ferry crossing to be established. And wherever ferry crossings had to be built, so came communities. This first community at the current location was just a few settlers who had purchased land there in 1801. A few years later another group of settlers who were finding their way through the new wilderness stopped there because the women in the party had had enough and wouldn't go any further. This group of settlers were from England and the Isle of Guernsey. Hence the county name Guernsey, of which, Cambridge is the county seat. Cambridge was selected to be the county seat because several of the land owners donated land and buildings to establish the county government in Cambridge. At this time, Cambridge and residents of Guernsey County were mostly involved in agricultural activities because of their farming backgrounds and the very fertile soil found in the area. Once the community became established, Cambridge remained rather static. People stopped on their way west, but few remained. Even with the establishment of the National Road which reached Cambridge in 1827, Cambridge was little more than a stagecoach stop. In fact, Cambridge was served by 4 daily stagecoach lines. By 1837, when Cambridge became an incorporated village, they only had just over 1000 residents. It wasn't until the railroad came through Cambridge connecting Wheeling with Columbus, that Cambridge started to see some real growth. By the 1880s, Cambridge was a crossroads of the B&O Railroad and the Cleveland & Marietta Railroad. The reason for this was simple: coal. Coal had always been in the area, but there was no way of transporting it to areas that could use coal, but didn't have any. The railroad made that possible and industries within the state needed coal to fuel their furnaces. Along with the coal fields, the area was also rich in natural gas. These natural resources became attractive incentives for many industries to locate in the Cambridge area. Cambridge first attracted steel manufacturing which resulted in a big surge in Cambridge's population. Then came glass, pottery and furniture manufacturing. During the Great Depression, most of the plants and mines closed and Cambridge became known as a ghost city. In time things began to turn around and some new manufacturers moved into the empty factories. 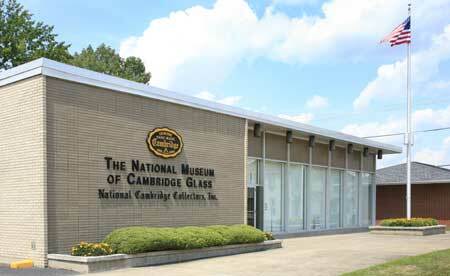 Cambridge became known as a light manufacturing center with glass, plastics, and pottery being the prime industries. Each year starting just before Thanksgiving, the residents of Cambridge begin their Christmas festivities, with the highlight probably being the put on a real Christmas Show throughout the holidays. It all starts with what they call the big Switch On the Sunday before Thanksgiving when events start happening all over town. Starting at Market Square with the grand courthouse light and sound music to the Dicken's Characters posed at what seems like every lamp post and in store front windows. If you're anywhere near Cambridge during the Christmas season, make sure to stop by the historic downtown area to view the free light and sound show that starts at 5:30 p.m. and runs throughout the evening. William Boyd was 40-years-old and an unemployed actor, when he read for a part in a movie—a character named Hopalong Cassidy. The original script described him as a whiskey-drinking, profane man that walked with a pronounced limp (hence the name). However, William Boyd transformed this character into a prince among cowboys wearing an all-black outfit sitting atop his white horse named Topper. Hopalong Cassidy became a national hero and soon epitomized the ideals of American righteousness. He never drew his gun first and didn't smoke, drink or kiss the girls. William Boyd, who was born in Hendrysburg, Ohio, just east of Cambridge in 1895, said that he sought to make Hoppy an admirable character who always used grammatical English. Boyd starred in 66 Hopalong Cassidy movies in his career, setting the record for one actor playing the same role, plus he starred in 52 television episodes as the same character. The Guernsey cow is not associated with Guernsey County, Ohio, except that they are both named for the same island off the coast of England: Isle of Guernsey.